Traffic safety foundation in Vancouver, Canada is using 3D pavement art to make drivers slow down in high risk areas and school zones. 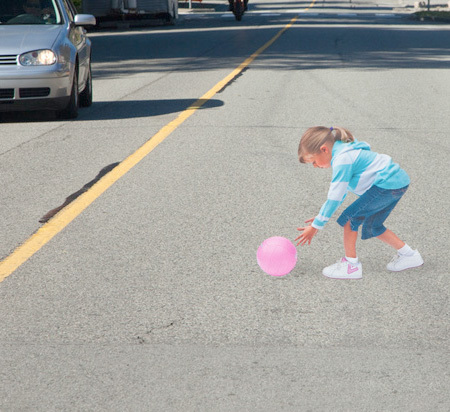 Optical illusion of a little girl chasing a ball has been installed by BCAA and Preventable on 22nd street in West Vancouver, north of Inglewood Avenue. 3D illusion rises up gradually from about 100 feet away and fades away by the time a driver approaches. Warning signs leading up to the illusion were installed to prepare drivers. The goal is to draw attention to the risk of children running onto the road. So, as people get used to it and speed up again, what happens when a real child happens to be in the street? But ok, the concept is very interesting – better than a traffic cam. Sounds like a bad idea. Because “the control is low”. What is a driver supposed to think when something appears, ….., and then just disappears? Might even cause accidents! A better idea would be to simply close down the street for cars. It was on the news for weeks ahead of actually putting it on the street, plus everyone knew where it was going to be – it’s an awareness thing, not trying to trick people into thinking it’s a real kid. i think the only effective way of using this, after many passings is if it was made a traffic law to slow down at these kid things. then it would actually be enforced, and a habit to slow down when you see children. Yes, this is not a good idea…..
@BigA – Cant Agree more!!!!!!!!!!! i agree with bigA, people get used to it and ignores real kids on the street. it’ll be like the story “The Boy Who Cried Wolf” no one will believe there’s really a wolf at the end. So what about people from outside Vancouver travelling through the area? The first thing they are going to know about it, especially at night, is some kid flying under the wheels of their car. Its a clever campaign but not very smart considering all the variables. you don’t actually imagine a child appearing out of nowhere like a mirage right? as seen on the video, its just an illusion and if you aren’t driving with 80mph, you can clearly see that its not an actual child. besides, its an alley and you wouldn’t drive that fast there. more than likely drivers will be distracted by the ad and not notice a real child running into the road! Doesn’t work, at least it didn’t work in the Netherlands… They painted some blocks on the roads in my neighborhood to make it look there were blocks on the road. After the first couple of days the effect was gone, and the driver went back to speeding in that road. I am in total agreement with BIGA, it was the first thought I had. What does this illusion look like for the motorists heading the opposite direction? Let’s assume for a moment that the illusion works & a driver really is going an unsafe speed. They’re instinctively going to swerve and, on a narrow street, that could send them into oncoming traffic. I had the same idea. After a while drivers will start ignoring it. Which means they might accidentaly ignore a real child too.. If I were a driver that saw an ad and got distracted, I`d reconsider calling myself a driver. What`s wrong with you people? You count on the driving skills of all people on the road but your own? You believe that the chance of someone hitting a kid is smaller than the chance of you stoping in front of a commercial? Really cool!!! The images could be varried so as not to get driver boredom. Easily the worst, most dangerous, ill-conceived design work ever seen. Great – so what happens when the guy trying to avoid hitting the 3D illusion crashes into a tree…a school bus, or another kid? Though thats probably true.. it only takes one time for it to have its full effect and for everyone to pay more attention. In my neighborhood this would be bad because it would draw your eyes away from the side of the road where the kids and the deer are coming from. So bad and dangerous …. so what does it look like from the other direction? Kid standing on there head spinning on there head like a break dancer ? Or how about we stop building roads where you feel comfortable driving 60 mph but have a posted limit of 35? Plant trees near road ways and allow on street parking has been proven to slow down traffic. Not only does it look nice, but it makes roadways safer. Great Idea, but I bet it wouldn’t fly in Idaho. 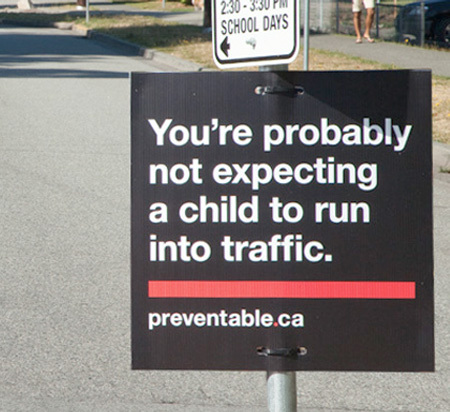 I don’t know which is worse, the image of the kid on the road, or the black sign preventable.ca put up ahead of the image. In the time it would take to read the sign, a kid could easily dart in front of then driver’s car and get killed. This campaign is soooo poorly designed that it’s criminal. This is idiotic. Governments and groups-with-a-cause need to stop looking for more and more cunning ways to manipulate people and start trying to treat people with a little dignity – appeal to them as intelligent adults. And if that doesn’t work, well you’re stuffed; that’s just life. So, why even put it in a parking ram? imean really… seems like a waste, and i agree with whoever said this reminds me of the boy who cried wolf. this campaign isn’t meant to trick people into thinking that there is a child therefore slowing down, it’s a reminder that children will be crossing / playing / etc. so when people see this and they are reminded of that (knowing this is just a 3d drawing) they should have a moral incentive to slow down. what ever happend to speed bumps and traffic lights? They may get used to the picture and possible run over real kids? Lol, I think it’s more about reminding them of why it’s there in the first place. Slow down. Like a string on the finger. It serves no real purpose besides a reminder. Albeit, I think a few stop signs would do the trick or an occasional trooper being stationed out there.